Moose-hunting season begins in just over two weeks, and hunters are up in arms over restrictions on access through military-training ranges that will make it hard for them to get back into their favorite camps. Fort Wainwright officials say they’ve tried to accommodate hunters’ concerns. But they say the restrictions are needed because the ranges around Fort Greely will be busy for the next few weeks with Air Force Red Flag training exercises. Michael Bryan says he won’t be going moose hunting this year, because he can’t get back into his camp near the base of Mount Hayes due to restrictions that’ll keep him from flying through airspace over ranges around Fort Greely. Bryan says he’s especially disappointed because Fort Wainwright officials announced the restrictions and training schedule on July 30th – too late for him to re-jigger his schedule. 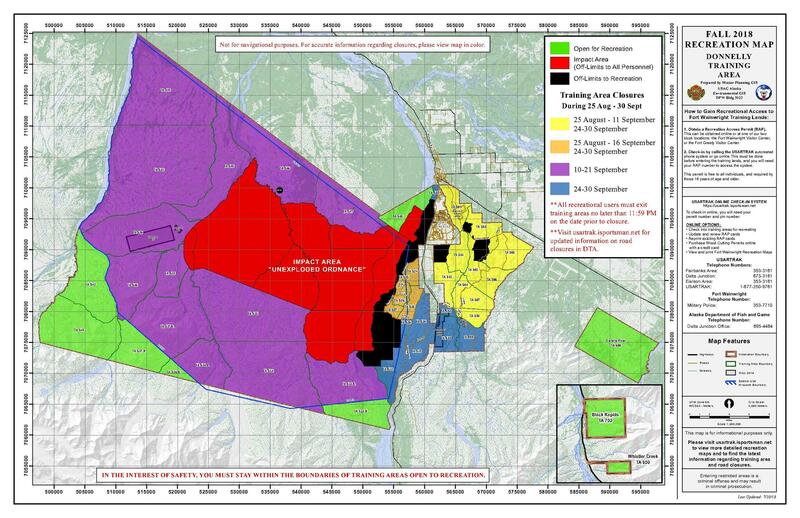 “At the 11th hour, the military published a training schedule and a map that eliminated or greatly reduced the hunting opportunities in a big portion of the eastern Tanana Flats,” Bryan said. Fort Wainwright spokesman Brady Gross says post officials have gotten some complaints about the restrictions over the past couple of weeks. But he says they’ve tried to accommodate hunters by coordinating with Air Force officials to stagger the Red Flag training schedule and open up opportunities for hunters to access the ranges or their airspace en route to their camps. “We did coordinate with the Air Force to keep as many areas open as possible,” Gross said. Bryan agrees the Army and Air Force have tried to reach out to hunters. But he says they didn’t reach very far. Gross says Wainwright officials didn’t have a lot of wiggle room this year, because this round of Red Flag training will be especially busy. He says that’s because the Air Force has adopted a two-year cycle for exercises that involves more aircraft and training on even-numbered years. And he says on those years, the ranges will have to be set up for the heavier schedule. “They need to modify the training area to support Red Flag training with their units,” Gross said. Wainwright officials emphasized the Red Flag training that began Thursday is essential to ensuring the pilots are trained and ready to quickly respond to trouble spots. Bryan says hunters agree with that. Bryan says he and other hunters have talked about the restrictions with staff of Alaska’s congressional delegation and members of organizations like Resident Hunters of Alaska as well as a state Department of Fish and Game’s advisory panel. Bryan says he hopes those talks will lead to a solution that won’t keep him and his fellow hunters from getting into their favorite hunting spots every other year. Tim Ellis is a reporter at KUAC in Fairbanks.